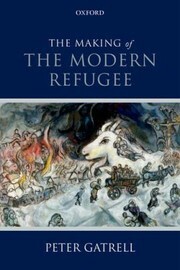 "The Making of the Modern Refugee is a comprehensive history of global population displacement in the twentieth century. It takes a new approach to the subject, exploring its causes, consequences, and meanings. History, the author shows, provides important clues to understanding how the idea of refugees as a "problem" embedded itself in the minds of policy-makers and the public, and poses a series of fundamental questions about the nature of enforced migration and how it has shaped society throughout the twentieth century across a broad geographical area--from Europe and the Middle East to South Asia, South-East Asia and sub-Saharan Africa. Wars, revolutions, and state formation are invoked as the main causal explanations of displacement, and are considered alongside the emergence of a twentieth-century refugee regime linking governmental practices, professional expertise, and humanitarian relief efforts." --book jacket. xii, 312 pages : maps (black and white) ; 24 cm. 9. 'Some Kind of Freedom': Refugees, Homecoming, and Refugee Voices in Contemporary History.